Aarathu Sinam has many exciting moments that make it worth a watch, writes S Saraswathi. Director Arivazhagan's Aarathu Sinam is the remake of Jeethu Joseph's 2013 Malayalam hit, Memories. The Tamil version has Arulnithi reprising Prithviraj's role from the original. Aishwarya Rajesh of Kaaka Muttai fame plays the female lead supported by Radharavi, Tulasi, Charlie and Robo Shankar. The film tells the tale of a grieving cop Aravind (Arulnithi) coming to terms with the loss of his wife and child, who were gunned down in front of his eyes. He drowns his sorrow in alcohol and soon his job is on the line. Meanwhile, the city police are baffled by a series of murders that has caught the attention of the media. Joint Commissioner (Radharavi), a well-wisher of Aravind, believes that handing the case to Aravind might help him snap out of his depression. How Aravind puts together all the pieces of the puzzle and tries to find the identity of the killer forms the rest of the story. The director maintains the suspense well without complicating the plot. There are no elaborate fight or chase sequences and neither is the narrative marred by unnecessary romance and songs. Aishwarya Rajesh appears briefly in the flashback scenes as Arulnithi's loving wife. Aishwarya Dutta plays the upstanding journalist Varsha, with a soft corner for Aravind. But the director has thankfully chosen not to give a romantic twist to the story. 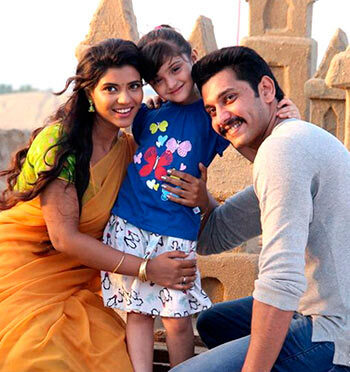 Arulnithi does well as a cop trying to cope with the loss of his loved ones. There is a refreshing subtlety to his performance. He keeps it simple without too much theatrics or loud, over-the-top dialogues. What ruins the narration though is the ridiculous comedy track that is totally out of sync. Robo Shankar, who is known for his spontaneity, superb dialogue delivery and wit, gives a lackluster performance. He plays the incompetent cop, whose sloppy investigative technique could have been explored to provide some good laughs, but ends up being boring. The director also fails to give us a glimpse into the sinister mind of the killer, which would have added a certain gruesomeness and intensity to the plot. The film is, however, technically sound with some intriguing camera angles by cinematographer Aravind Singh, remarkable background score by Thaman and crisp editing by Rajesh Kanan. Director Arivazhagan's Aarathu Sinam is a decent crime thriller with plenty of exciting moments that make it worth a watch.